Cooper Gillespie is a Welsh Springer Spaniel, a dog with an appetite for the good life. Susan Orlean is Cooper's human, and personal typist, who also happens to be a successful novelist, who wrote "The Orchid Thief" and "Saturday Night." 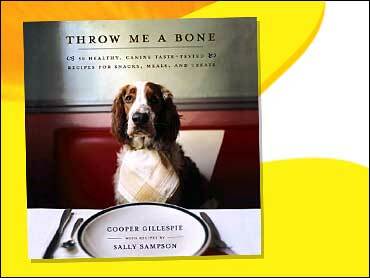 Orlean told The Early Show's resident veterinarian Debbye Turner that she taught Cooper how to write the cookbook, "Throw Me a Bone." "I felt it was time for a dog to just speak," she laughs. "I'm a writer and so I guess it's a little genetic maybe that my dog would know how to write. He's not a good typist." The two enlisted the help of accomplished cookbook author Sally Sampson. The collaboration of two humans and a dog produced 50 Cooper-approved recipes -- food that dogs would think is good and that is good for them. Orlean is a successful writer and Sampson is a successful human cookbook author, so why are the two women cooking for dogs? "It's a very difficult [question] to answer, except, can I just say, look at [Cooper's] face," Orlean says. "When I cook for my husband, he doesn't look this happy. He looks happy, but he doesn't look that happy. And he's usually not panting." Orlean says Cooper is her taste-tester, and she also solicited suggestions for recipes from friends and dog trainers. "We are smart enough not to do a cat cookbook," Orlean laughs. The author admits Cooper, like most dogs, may be willing to eat just about anything, including a six-months-dead squirrel. "Just 'cause a dog will eat anything, doesn't mean you should feed them everything," says Sampson. "All of these recipes are nutritionist-tested." The cookbook has complete meals and delectable mid-day snacks such as Puppy Power Bar Cookies, Goldie's Meatloaf Cupcakes and Tuna Training Treats. "This seems to be a big surprise to people that dogs like tuna so much," Sampson says. "And look at him. He's so excited. Every dog we've given this to has loved them." Orlean says the tuna treats are good for dogs because they contain a lot of protein, but the dogs don't care because they are more concerned that the snack tastes good. Snacks for a dog may be easy to create, but not many people would have time to cook for a dog. Orlean says that's a mistake because it's fun. "There are some who cook for a dog everyday and to them I say, 'God bless them, your dogs are very lucky,'" she says. The cookbook for dogs is also a great activity for parents and kids, says Orlean. "It's very liberating to cook for a dog since you don't have to worry as much about the little niceties of cooking," she says. Cooper seems to be pleased with the dog cookbook. Orlean says, "His only worry was would there be enough for him to eat at the book party, and we answered that with a resounding 'yes'."